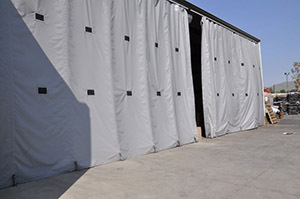 Commercial Doors Direct Tarps are manufactured from waterproof S400 18 oz. PVC coated nylon with rip-stop mesh reinforcement, or a multi-mesh PVC coated nylon. They are available as either flat or fitted, in a choice of sizes and colors, and can be customized to include “D” rings, straps, vents, and more. Although primary uses are to provide weather protection or containment for hauled loads, they are also well suited for many other applications. Equipment Covers can be fabricated from the same rugged tarp materials and specially formed to fit many different shapes. 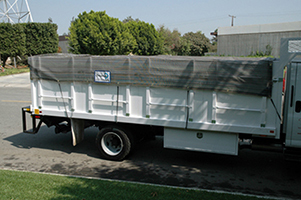 Environmental Curtains made of tarp materials can be provided as sliding or vertical rolling units for a variety of uses such as privacy screens, bug screens or cargo covers on the rear of tuck trailers. 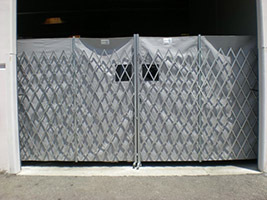 Welding Screens maintain visibility of work areas while reducing welding arc glare. They are made from yellow or green transparent vinyl and are available as either fixed-frame or operable models for portable or stationary use.